Last weekend I attended a dinner to celebrate the 90th birthday of the Royal Flying Doctor Service (RFDS). It was a tremendous event befitting of this amazing organisation which has done so much for so many Australians. The RFDS was started by the Very Reverend John Flynn, OBE, DD. As a Presbyterian Minister, he initiated the Australian Inland Mission to minister to the spiritual, social and medical needs of those in the Outback. Over time, Flynn received a bequest for an ‘aerial experiment’ and then teamed up with Qantas to start what became the RFDS on 17 May, 1928. Flying from Cloncurry with an old bi-plane named ‘Victory’, the RFDS treated over 225 patients via 50 flights to 26 destinations. The following year, a South Australian man named Alf Traeger invented a pedal-operated generator to power radio receivers. This allowed those living in isolation to call on the Flying Doctor when in need. Flynn’s legacy is an organisation that helps someone every two minutes of every day. Last year the RFDS supported over 336,000 patients through their fleet of 69 aircraft and their 24 air bases. 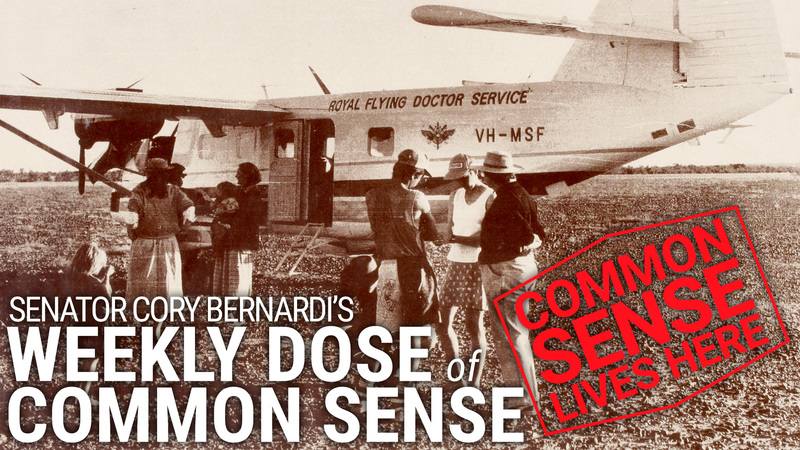 After 90 years, the RFDS proves that one man’s vision can save countless lives and literally change a nation. Flynn is quoted as saying “If you start something worthwhile – nothing can stop it”. His words are a timely reminder that however challenging a task may be, however large the obstacles may appear, there is always a path to success. Although many may argue that politics is a less virtuous pursuit than Flynn’s vision of medical care for regional Australians, it is a vital endeavour. For those of us who want to protect and preserve our way of life and recognise the important structures and values that are critical to that end, the current political obstacles can seem insurmountable. A militant political left are on the march and are hell bent on razing all that came before them. In their sights are the freedoms, traditions and social mores that have been a lynch pin of western society for generations past. They are our conservative foundations, established from thousands of years of lived human experience, now being jettisoned with gay abandon in a radical experiment. The only way to stop this crimson tide is to have a strong and principled conservative voice within our parliament. Only the Australian Conservatives have the policies, the courage and the principles to do what needs to be done. Together, we have started something worthwhile and with your continued support we can prove Rev. Flynn’s adage that nothing can stop us! Thomas sells out to meet new friends, which bank has a cunning plan to cover cleanup costs and indeed why did the chick cross this road? Barnaby’s privacy gets complicated as does this mum’s child snap. There was a close shave for these hotel patrons, the ABC stirs the gender-neutral dunny in Mildura and Deadpool gets more than he bargained for. Snowflakes gun for a World Cup star, no goals in this gaol and corruption-wracked Brazil grinds to a halt. Bureaucrats ‘BAME’ hiring panel for consistency but they’re Delaware of their ‘white privilege’ here. EU says pay up or get on your e-bike or golf cart, Egypt’s highest court causes Google mayhem after getting offended and check out the world’s most useless Masters degree.